It's not that I really wanted to try duplicate stitch, or that I wanted to bow down to the "chocqua" gods. No, it's all smoke and mirrors. 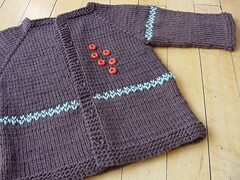 I started this little chocolate toddler cardigan mid-July last summer (yes, many months ago). I was well on my way to finishing it within a few lazy weeks, but then...I started the second skein. 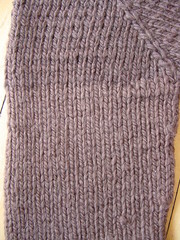 Yes, it was from the same dyelot, but as I started knitting it was so clearly milk chocolate next to dark chocolate, breakfast blend next to espresso. It was jarring and disappointing. I really didn't feel like ripping it out at the time. So I started thinking of options. It's cotton (a wonderfully soft and lovely cotton by Blue Sky), so I couldn't overdye it very easily. If I ripped back and alternated skeins it would look stripey - blech. I could rip out the whole thing and see which of my 4 skeins looked the best together. While I was thinking I finished the body of the sweater - just to see what it would look like. I couldn't decide what to do, so the sweater went into a time out. I kept it was an active WIP in Ravelry, just so I would remember I should deal with it at some point. I have been jonesing for a FO lately - my knitting mojo has been on vacation, the last thing I have actually finished was my Pi - gasp, that was back in January. I thought to myself, "this little sweater only needs some sleeves. I will just continue on and finish the sleeves and see what I think." As you can probably guess, it was no better, it was just finished. So, what to do with my little two-toned cardigan? My one complaint is that I was knitting this sweater as gender neutral - to be swayed one way or the other by button choice. 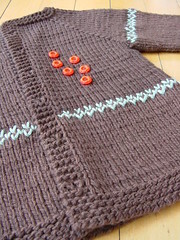 Now with the duplicate stitch, I think it looks more feminine regardless of which buttons I choose. So I picked up some little orange flowers. I just couldn't pass them up. So why have I been in such a knitting dry spell? I have been focused on a different Work in Progress - which should be finished late September. I have been feeling the knitting mojo finally coming back lately, and have some ideas of knits to work on before this fall. 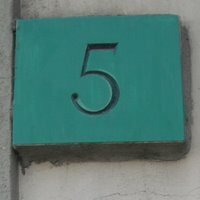 I have been reading your blog for awhile here and really enjoy the updates. That sweater is very cute too. Love the sweater. 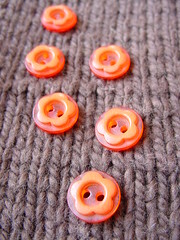 I just put those same buttons on a cardigan for a baby too! Congratulations! How exciting! I can't wait to see the finished project! wonderful news--and a great save with the sweater!! 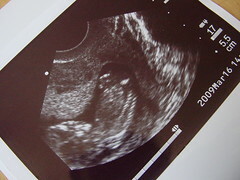 Hi there- I just found your blog, and couldn't resist commenting when I saw the ultrasound pics. I'm a sucker for ultrasound pics! Congrats! Oh La - congrats to you, Mr. 5, and the Bud!!! I haven't stopped by in awhile and just saw all your posts...wonderful news!! Hope you are feeling well - hugs!